Ah Jook Ku, the first Asian-American reporter for the Associated Press and retired executive secretary of the Honolulu Community-Media Council, died Monday in Leahi Hospital at age 97. 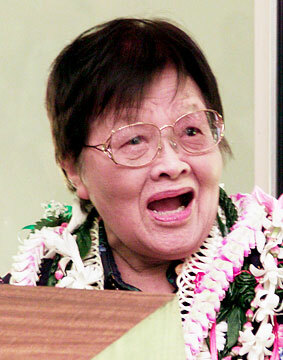 She also was the first Asian-American female writer for the Honolulu Star-Bulletin. In the 1940s she covered life in China and the government of President Chiang Kai-Shek. But in later years she was regarded as the "guiding force" of the media council, said former Chairman Richard S. Miller. Ku was known as a feisty advocate for freedom of information and journalism standards. Ah Jook Leong Ku was a groundbreaking young reporter in the 1940s, covering life in China and the government of President Chiang Kai-Shek for the Associated Press. Ku, 97, died Monday in Leahi Hospital. "She was the guiding force for the whole thing," said former council Chairman Richard S. Miller, University of Hawaii law professor emeritus. The council "was designed to protect the First Amendment ... and to hold the media to ethical standards." Ku grew up in Ewa Beach, one of 15 children, and "the head of the family wasn't eager about educating women. So she got a scholarship to the University of Missouri Journalism School," Miller said. "She didn't reminisce. She was always up to the minute ... building on what was happening now," he said. "She was very active in the 1980s when the Sunshine Law was being violated and loopholes led to less-than-open government," said Beverly Keever, UH journalism professor. "She was the pivotal point" for community efforts to persuade the state Legislature to keep open government. Attorney Thomas Grande, former director of Common Cause, a citizen watchdog organization, recalled, "She was an activist with a kind heart and a gentle manner, a tireless advocate for free press and for civil liberties. She was very humble. It was never about herself." "Jookie" Ku was one of the original members of Save Our Star-Bulletin, a group of community leaders who successfully sued in federal court to keep Liberty Newspapers, the former owner, from shutting down the newspaper in 1999. "It was her last hurrah as an advocate," said Miller, also a member of the SOS coalition. Ku worked as an information specialist for the state Department of Education for more than 20 years, retiring in 1975. She retired from the Honolulu Community-Media Council in 2002. The organization presented her with its Fletcher Knebel Award for her contributions to journalism. Ku is survived by sister Yuk Jun Joseph and several nephews and nieces. Funeral services will be held at 10 a.m. Aug. 21 at Borthwick Mortuary. Friends may call after 9 a.m.